One franchisee was able to produce proof of this by supplying me with an original email sent to him on February 7, 2013, from an individual in the Franchise Development Group, Dickey’s Barbeque Restaurants, Inc. In the email, the Dickey’s representative states that “This is a sample Only. I am by no means making an earnings claim with this spreadsheet.” Some may say that 2013 information is too old, but remember those signing a franchise agreement in 2013, would have opened 6-12 months after that, and would be the failures of 2016-2018. 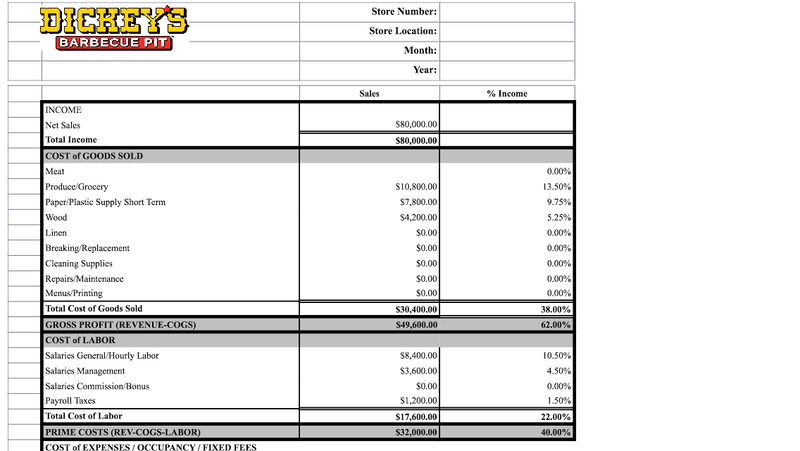 This sample spreadsheet is filled out with sales of $80,000 a month, which is $960,000 per year. Why would this be so much higher than the annual figure in the QSR story? Could this be the sales figure needed to qualify for loans, including the minimum debt coverage ratio required for an SBA loan? What makes this spreadsheet unprofessional is it is not really a usable spreadsheet. Most numbers are filled in manually, not using formulas as would be normal. If you change the sales number, none of the costs change, including royalties. If you look carefully at the sample above, the numbers don’t even add up. For example, the three items in Cost of Goods Sold are $10,800, $7,800, and $4,200, which adds up to $22,800, but on the spreadsheet the total given is $30,400. If this was not meant as a disclosure, as the Dickey’s representative claimed, why was it not sent out as a usable spreadsheet where you could change the numbers? To be usable, a prospective franchisee would want to change sales, and for example, the rent costs they were looking at to see if the business was viable. Why would Dickey’s send out such a useless tool, unless their purpose was to make a financial performance representation? A few have questioned my motivation on the subject of Dickey’s, and state I hate franchising. Nothing is further from the truth, I love the franchise business model, and will fight to protect it. However, I feel too many in the industry have lost their moral compass, and ignore those most at risk, and the largest investors in the industry, the franchise owners. I will do everything I can to represent and advance the causes of franchise owners, so that their businesses are viable, and their investments are protected. 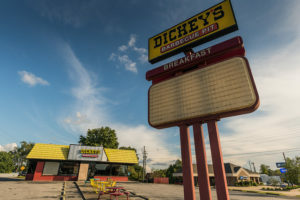 To date, there have been no Dickey’s BBQ franchises in Maine, however, it is important to remember that the actions by this franchisor, while not the norm in the industry, is not alone. Prospective franchise owners must use caution when buying a franchise. Existing franchise owners must be active, hopefully with a franchisee association, to make sure franchise owners are protected from tactics that rob them of their profitability and equity.